Two weeks ago, The JOIN for Justice summit brought together an amazing group of folks on April 29th and 30th at Hebrew Union College in New York to sharpen their organizing skills, develop relationships with like-minded peers throughout the country, and articulate an growing vision of the movement of Jews committed to social change. The summit was a whirlwind of workshops, relational meetings, one-on-ones, and inspirational speeches. The sessions I attended, “Building Young Adult Jewish Power, Inside and Outside of Mainstream Jewish Institutions,” “Organizing and Mindfulness,” and “Community/Labor Coalitions and Domestic Workers Rights” re-charged me in my passion as an organizer and connected me to some amazing allies in discussions of building a stronger base of power of young Pursue-type folks to move the Jewish community in the directions we hope to see. In the opening session, Nancy Kaufman, CEO of the National Council for Jewish Women, gave an anecdote on the long-term movement building work the Jewish community so that something like the JOIN for Justice summit was possible, saying that in 1990, it was a very lonely place in the Jewish community for those working for social justice. Sitting in a crowd of 230 self-identified Jewish organizers, 90% of us under the age of 35–and 100% standing in affirmation of the belief that the Jewish community should be organizing for justice in the world–it was moving for me to be reminded of how far the Jewish community has come in organizing for social justice. As an alum of AVODAH and AJWS, this gathering of organizers, activists, clergy, non-profit professionals, and allies is the Jewish community that I have come of age in. Many of us young summit participants have been trained for leadership through fellowships, seminars, service-learning programs, one-on-ones, and conferences since we were in high school. We are ready for leadership; we are ready to attempt to responsibly wield the power of American Jewry. Looking around the room, I realized that this was not just a rag-tag group of Jews on the fringe fighting for a slice a pie, but the possibility of the future of the mainstream. Micah Weiss is the assistant director at Etgar 36, leading experiential education trips for Jewish teenagers that teach about history, politics, and activism, but will be moving back to New York in one month to attend Yeshivat Hadar. Last year, Micah was an AVODAH Corps member in Brooklyn where he worked as an anti-gun violence community organizer and inter-group facilitator at the Crown Heights Community Mediation Center. Micah graduated from Wesleyan University in 2010 with a degree in Religion and African American Studies. 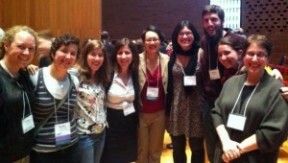 This entry was posted in National Summit and tagged AJWS, Avodah, power. Bookmark the permalink.